The competition to win new banking customers is about to intensify, as the UK's largest supermarket launches its first current account. Some 17 million customers of Tesco will be offered extra shopping discounts if they open an account. The supermarket is one of four banks offering new current accounts this year. Marks and Spencer launched its first free account last month, and Virgin Money is expected to follow soon. TSB - which is being spun off from Lloyds - offered customers a new account at the beginning of April. The Post Office too is continuing to roll out new current accounts across the UK. Benny Higgins, the chief executive of Tesco Bank, told the BBC the account was "very transparent". "Customers tell us they are very tired of the smoke and mirrors and the need to pay attention to the small print. We are setting out to be very clear and transparent," he added. Nevertheless, Mr Higgins told the BBC he did not expect a sudden rush of customers. "I don't think it's likely that it's an impulse buy and that we would have high levels of switching overnight. But I hope, in time, this will become a very good product for very many Tesco customers and beyond." Tesco may have reported a 6% fall in annual profits in April, and a further slide in sales last week, but it is already a major force in banking. Tesco Bank has six million customers, and over 12% of all credit card spending in the UK is on one of the store's cards. Media captionTesco Bank boss Benny Higgins: Current account "challenging status quo"
It may now be able to gain further advantage over some its rivals with the lure of extra discounts. Account holders will be able to earn money off in-store, or when they use their debit cards elsewhere. By using their Tesco debit card at the till, they will earn one extra Clubcard point (worth at least 1p) for every £4 they spend. When account holders shop elsewhere, they will also earn one point for every £8 they spend on their cards, equivalent to 0.12p. Rival Marks and Spencer offers its customers a £100 voucher if they open a current account, plus one point for every £1 spent in-store. 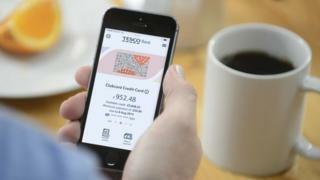 The Tesco account will be free, providing customers pay in at least £750 a month. Otherwise it will cost £5 a month. It will also pay customers 3% annual interest on amounts up to £3,000, where interest is reinvested. "We think this product is absolutely first class value," said Mr Higgins, adding that customers "do not enjoy languishing with 0% interest" on current accounts. Now that Tesco has weighed in, maybe the frenzied contest to handle our money, which ministers have been so anxious to see, will finally begin. The big four, Lloyds, RBS, Barclays and HSBC are sitting on three quarters of the market. But one City banking expert told me current accounts are becoming a "big battleground", with M&S, Tesco and TSB in the mix and Virgin Money launching this year. The Tesco account is a good all-rounder. It offers 3% interest and the overdraft charges are attractive. It's true that you can get even more interest elsewhere and some will be put off by the £5 monthly charge. But the point is that for 17 million Clubcard members, the promise of earning even more points and banking in the store will be big attractions. The sheer scale of the Tesco retailing machine could propel it into the front rank, rivalling Santander, Nationwide and TSB in opening new current accounts. There will be no fixed monthly fee for an agreed overdraft, but rather a flat 18.9% interest rate. Kevin Mountford, the head of banking at MoneySuperMarket, described the account as a "solid offering". "In addition, the minimum monthly fee-free funding level of £750 is very competitive, with TSB being the only other provider (sitting within the interest-paying current account sector) to beat it at £500." The executive director of Which? Richard Lloyd, said the new Tesco account was likely to "appeal to the many customers fed up with shoddy service elsewhere." But he added that potential customers should weigh up all the options before signing up. "As always, people should look carefully at how they use their existing current account before deciding if this is the best choice for them," he said. Tesco Bank has been planning to offer a current account for a number of years. Mr Higgins said that when Tesco took over full control of the bank's operations from RBS in 2009 it had to "embark on the Herculean task of building a bank from scratch". In 2012, the bank said it was working on a current account, but that it would wait for rules to make it easier for customers to switch accounts to come into force before launching the product. The bank-switching redirection service was launched in September 2013. Mr Higgins said the launch of the current account had been put back in part by product testing. "It's probably, in fairness, a few months later than we would have expected, partly because we've done a huge amount of testing," Mr Higgins said. "But, you know, today we're very pleased with the product."